If you browse through parenting advice and articles today, certain ideas pop up again and again. Children are disrespectful. Mothers and fathers are overwhelmed. Parents feel like they’ve lost themselves in the process of being parents! This is a new phenomenon, right? We are assured by our parents and grandparents, and perhaps even by our great-grandparents, that this was not a problem in their day! Maybe great-grandma’s memory has softened the edges a little bit, because a century a ago, the experts addressed all these issues. The responsibilities of motherhood look different than they did 100 years ago. More moms work outside the home now, and although we no longer make our children’s clothes or have to hand-wash them, there’s plenty of laundry to do. Convenience food simplifies kitchen duties, but dishes still need done, and many moms make dinners from scratch to save money and provide better nutrition. Life is different, but moms are still busy! Some days are a marathon from wake-up to collapse-in-bed, without a real break for meals, bathroom, or even a few minutes of quiet. (We can all relate–right?) It’s true for moms who work outside the home and for moms who stay home. What rights should mothers remember to protect? Advice from a century ago still rings true today. 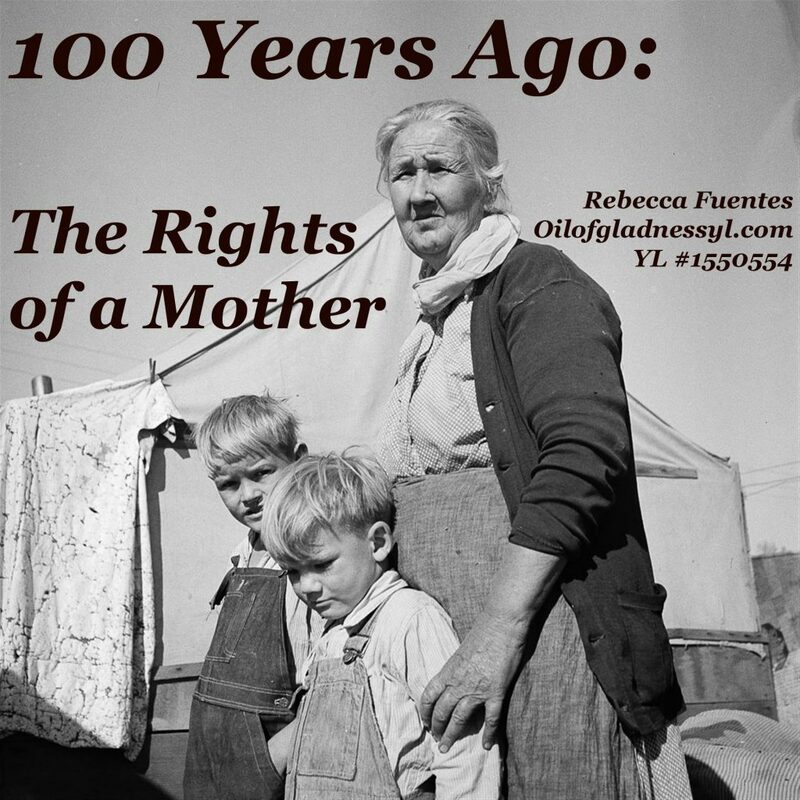 So, what rights did expert Caroline Benedict Burrell remind overwhelmed moms about 100 years ago? The Right to Individual Tastes: No, it doesn’t just mean that moms get to have an opinion. Burrell means that women should not give up their hobbies and interests when they become wives and mothers. “One should take the time, guard sacredly her right to individuality, if only because it is best for the children in the end.” I’m going to be the first to admit that many of my hobbies evaporated with my first baby. I stopped writing. I stopped sketching. For a long time, even my interest in reading waned. I don’t blame all of this on motherhood and sleep deprivation. Quite a bit of it was due to poor diet. My body and brain couldn’t sustain both being a mom and being creative. As I improved my diet by focusing on nutrient-dense whole foods, my creativity re-awoke. As I replaced my personal care products and cleaners with essential oil infused ones, my focus came back. Even as the desire came back, I had to carve out time for my creative endeavors. They don’t look like they used to–my writing is more blogging and less fiction, and my art is crochet projects instead of sketching and painting–but they are there. According to Burrell, children will look up to a mom who works on her own interests and pursuits instead of letting herself be subsumed into motherhood. The Right to Courtesy: “A mother ought to study how to hold her own in the family, not with self-assertion or arrogance, but with a quiet dignity. To yield all, to be a servant in fact if not in name to one’s children, is to do them the greatest possible harm.” In a nutshell, children should be required to speak to their mother with respect. They should respect her privacy and her property. They should not be allowed to treat her as a sibling or friend they can run roughshod over. In Burrell’s time, this sort of thing was considered a sign of ill-breeding. Now, we can see examples of this everywhere, as parents are taught to question their own authority. If the parents aren’t the authorities in the house, then the children take their place, dictating what they eat and where they go by their whims. This isn’t just bad for the mother and the marriage; it’s bad for the children as well. Eventually, they will go out into the world. If they are unable to follow someone else’s rules (the boss’s, or their spouse’s), it’s going to be a much harder lesson. By requiring courtesy in the home, we teach them to leash their whims. There seems to be a reason that Caroline Benedict Burrell’s book are still available to purchase: the advice, with a few updates, still rings true today. To survive as a mother in an increasingly hectic world, we need to simplify and garner help from our children. We need to nurture our minds, hearts and souls with our own interests and hobbies. Most of all, we must remember that mothers have the right to courtesy and respect from their children. Studying my own life, I can see how these will make the family, and me, healthier and happier. *All quotes in this post are from The Child Welfare Manual 1915 and 1919 edition, from the article titled “The Rights of a Mother” by Caroline Benedict Burrell, found on pages 91 and 92.